This is great for pretend/dramatic play. 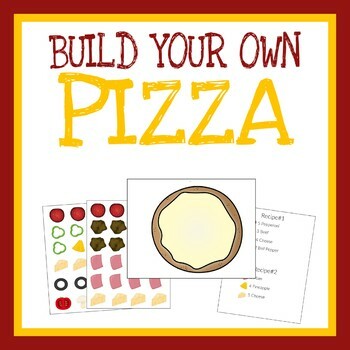 By using the recipe sheet, children can practice counting as they add the recommended amount of toppings to the pizza. The pizza sheet can be used as a playmat as is or it can be placed inside a file folder. The toppings can be stored in a plastic baggie and if using a file folder they can be attached to it with tape or staples. These files can be printed on white cardstock or on a standard 8.5 ×11 inches white sheet of paper. This is for ONE person use. Not to be resold.